The world loves the nostalgia of a good time capsule story, but things don’t always go according to plan. In the case of Tulsa, Oklahoma, one time capsule that was supposed to yield buried treasure turned out to be a disappointment 50 years in the making. The year was 1957, and the city of Tulsa was celebrating the state’s 50th anniversary with a competition. The prize was a brand-new Plymouth Belvedere with only four miles on the odometer. But like any big PR stunt, there was a catch: They wouldn’t announce the winner for five decades. The car, which became affectionately known as Miss Belvedere, was designed to act as a time capsule filled with trinkets, photographs, and even a case of Schlitz beer. Why that car specifically? According to the chairman of the ’57 Tulsarama Golden Jubilee Week festivities, the Plymouth Belvedere was "an advanced product of American industrial ingenuity with the kind of lasting appeal that will still be in style 50 years from now." To win Miss Belvedere, the residents of Tulsa had to guess what the population of their city would be in 2007—the year of the state’s centennial. More than 800 people entered the competition, with their estimates written on postcards and placed, along with various other pieces of Tulsa memorabilia, in a sealed steel drum that would be buried behind the car. Meanwhile, buried inside the car were the original keys to Miss Belvedere, a microfilm copy of all the competition entries, and the contents of a woman’s purse—complete with bobby pins, cigarettes, tranquilizers, and an unpaid parking ticket. A huge reinforced concrete vault was built beneath the pavement outside the Tulsa County Courthouse, and on June 15, 1957, it was sealed shut with Miss Belvedere waiting patiently inside. As 2007 drew closer, local residents began preparations for the unveiling. A website called BuriedCar.com featured discussions and pictures of the car alongside information on where to stay if you were coming into town for the event. Needless to say, if you were a Tulsa resident, it was hard to escape talk of Miss Belvedere’s imminent reemergence. He may have been a little too confident. When the vault was reopened on June 14, 2007, the workers were met with a heartbreaking sight: Miss Belvedere was sitting almost completely submerged in water. It seems that for all their nuclear-age optimism and forward planning, the people of 1957 Tulsa neglected to consider the horrors of stagnant groundwater, and they hadn’t made the vault waterproof. To be fair, Miss Belvedere was draped in a plastic sheet, but that proved to be of little use after being submerged in water for years. As Miss Belvedere was raised from her watery grave, the crowd’s optimism turned to resignation. The Plymouth was loaded onto the back of a truck and driven to the nearby convention center for her official unveiling, where celebration mixed with melancholy as the 9000 Tulsa residents in attendance mourned the bucket of rust they’d been waiting 50 years to dig up. The full extent of the damage was immediately obvious: every inch of Miss Belvedere was covered in rust. The rear suspension springs were so thoroughly rusted that the car sat low in the back as it struggled to support its own weight. The interior was now a haze of indistinguishable sludge, and the few items put in the glovebox (the microfilm, the purse contents, and the keys) were almost all completely destroyed. Whatever survived was barely recognizable. Miraculously, you could still almost make out signatures on the wheels where locals had signed their names in 1957. It wasn’t all doom and gloom, though. The steel capsule buried with the car had perfectly preserved its contents, which now emerged as pristine pieces of Americana. The most vital items to have survived among the 10 gallons of leaded gasoline, five quarts of oil, 48-star American flag, and other items from Tusla's past were the 821 postcard entries that would determine the rightful owner of the hunk of historic junk as well as the $100 savings account (which, with 50 years of interest, was now worth $700). One problem: Raymond had been dead for 28 years. As per the rules of the competition, Miss Belvedere would go to Raymond’s closest relative—his wife. Unfortunately, she’d been dead for 19 years. The couple didn’t have any children, so Raymond’s sisters, 95-year-old Catherine Johnson and 86-year-old Levada Carney, were left with the honor of dealing with Miss Belvedere. Foster’s goal, he said, was just to make the car presentable—making it drivable was out of the question. After two years and an estimated $20,000, Miss Belvedere was far from pristine, but the results were still astounding. For the first time in over 50 years, Miss Belvedere’s original paintwork was visible, albeit still pockmarked with spots of rust. The remarkable restoration turned Miss Belvedere into something that once again actually resembled a car, as opposed to a car-shaped hunk of rust. With the partial restoration complete, it was time to find a home for Miss Belvedere. Foster set his sights on the Smithsonian, which rejected the idea due to the car’s condition. 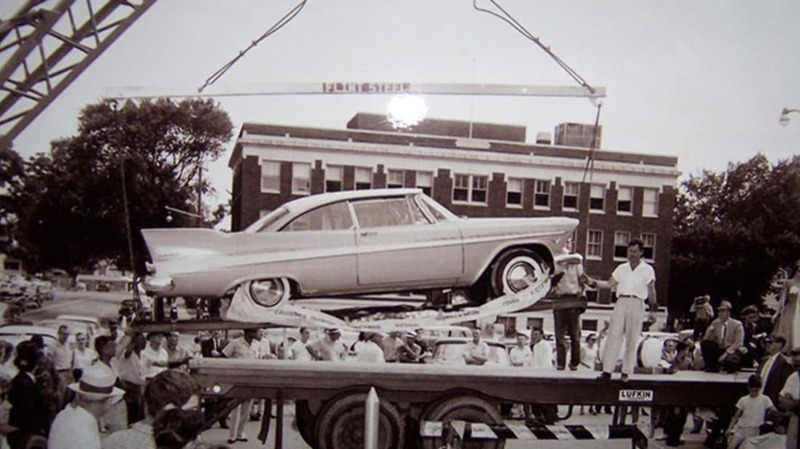 Miss Belvedere sat in limbo until 2015, when the Historic Auto Attractions Museum in Roscoe, Illinois added the car to its collection. It seems that Tulsa can’t get enough of putting vehicles in time capsules. In 1998 they buried a Plymouth Prowler in an above-ground pressurized vault (presumably they learned their lesson about underground chambers). The vault is due to be opened in 2048. In 2007, just five months after the unveiling of Miss Belvedere, they interred a Harley-Davidson motorcycle, to be unearthed in 2057. A little further afield in Seward, Nebraska, sits the “World’s Largest Time Capsule,” which was buried in 1975 and contains 5000 items, including a then-brand-new Chevy Vega—and allegedly a second car that nobody can really remember. We only have to wait 'til 2025 to see what’s inside that one.